Toronto Maple Leafs defenceman Morgan Rielly knew he could be a better offensive player. In his final season with the Moose Jaw Warriors of the Western Hockey League, Rielly collected 12 goals and 42 assists. His 54 points during the 2012-13 season were fifth-best among defenceman in the league third-best on his team. However, his flair for offence had not translated at the professional level. Heading into Thursday's game, Rielly had five goals and 26 assists in 46 games. His 31 points are just five shy of his career-high set during the 2015-16 season over a full 82-game schedule. "I think it's just confidence," Rielly said at practice this week. "I worked on some things in the off-season, but it was also about being really motivated over the summer to be better." Last April, the Leafs' season ended with a first-round playoff exit at the hands of the Washington Capitals. Toronto had caught teams by surprise, given they were among the youngest teams in the league and had just come off a season in which they finished last (29-42-11, 69 pts). Rielly, having just completed his fourth season with the Leafs, anticipated that he would have to improve his game. Recording more points was one area where he could show improvement. "I wasn't all that happy with the offensive aspect of my game last year. I had more to give," Rielly said. This past summer, Rielly incorporated more skating into his off-season training. He also used the services of Leafs skills consultant Darryl Belfry, who has become the pre-eminent skills coach around the league. He has worked with some of the best NHL players, including Sidney Crosby, John Tavares and Patrick Kane. Unlike traditional skill development, Belfry reviews tape of players and pinpoints movement inefficiencies that once corrected, show improvement with immediate results. "When I created my system, I wanted to develop it in a way that can make a large impact on the player immediately," Belfry said in a 2014 interview. "I found myself doing more analyzing of the athlete to see what is it specifically that he needs, what is the next level?" In Rielly's case, there were tweaks to his positioning that have led to more point production. 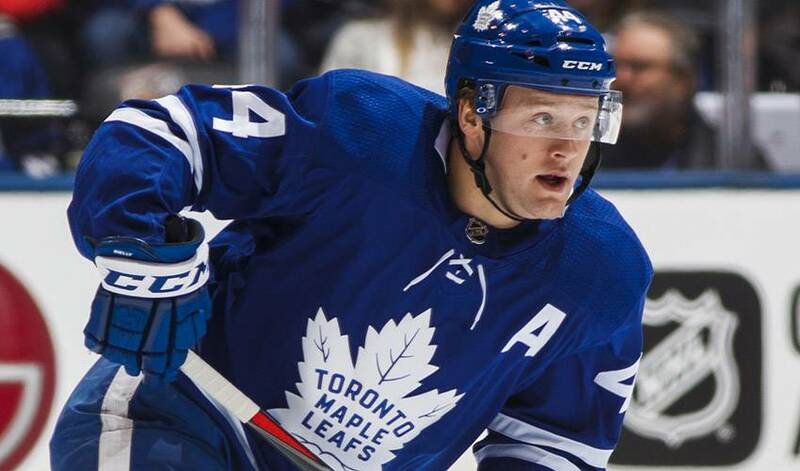 While in the opponent's zone, Rielly has seen tendencies of players and responded by staying closer to the boards resulting in more wins during puck battles. "We're talking a lot, and it's good to have a voice up there help you out," Rielly said of Belfry. Other factors have contributed to Rielly's success offensively. Twelve of his 31 points have come on the power play. He leads the team in average ice time with the man advantage at 2:20 per game. Last season, Rielly averaged just 0:58 of power-play time per game and recorded five points with the extra man. When Rielly was selected fifth overall by the Leafs at the 2012 draft, they hoped that he could one day become the team's No. 1 defenceman. Rielly has seen different coaches and general managers come and go since then, but the vision for him has never wavered. This summer, when Toronto made changes to their roster, the defence was left mostly intact, with the exception of signing veteran defenceman Ron Hainsey to a two-year, $6-million contract. It was the biggest vote of confidence for Rielly that they believe he is their No. 1 defenceman. "A lot of people look at guys like Drew Doughty (of the Los Angeles Kings) at 18 years old and think that's how you become a No. 1 defenceman, but for every one of those, there are a bunch who become No. 1 with a bit more time, and he's doing that," Hainsey said of Rielly. Although Rielly has taken significant strides offensively, it's the defensive side of his game that Toronto has come to depend on most. Given Toronto's recent struggles to score — they had just 10 goals over six games in January heading into Thursday's game in Philadelphia — Rielly's ability to shut down the best players is still his strength. "We need Mo not only to be good offensively but to be a good lockdown guy for us, playing against the best people and be a good star for us," said Leafs coach Mike Babcock. "He's an important guy on our team and has to keep going." Note to readers: This is a corrected version of an earlier story. The Maple Leafs scored 10 goals in January before Thursday night's game in Philadelphia, not two as previously stated.